After linking for the past two weeks with Collaboration Cuties and learning so much, I decided to try again this week. The mentor text subject area this week is SCIENCE! I really had to think hard to produce a text that I use that I felt would have value or usefulness with most any state's curriculum. Here in Alabama our third grade Course of Study has objectives in Science and Social Studies that address natural disasters, storm safety, and relief/recovery efforts following a disaster. So, I settled on a chapter book I use every year when we are studying about natural disasters. 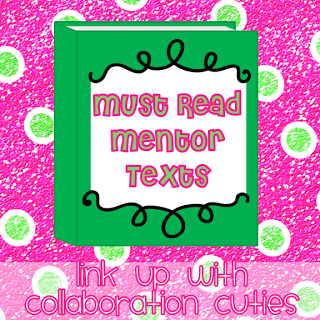 Thanks to the two teachers that collaborate on this blog for the mentor text link up! Night of the Twisters is a chapter book about Dan Hatch, a 12 year old with a small baby brother. 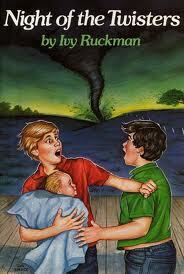 As a storm system moves across their community Dan must help his little brother and his friend Arthur into the basement of his home hoping to find shelter from a tornado that passes right over their house. When they emerge from the storm they find the neighborhood completely destroyed. They team with Arthur's sisters to look for Dan's parents and an elderly neighbor, Mrs. Smiley. 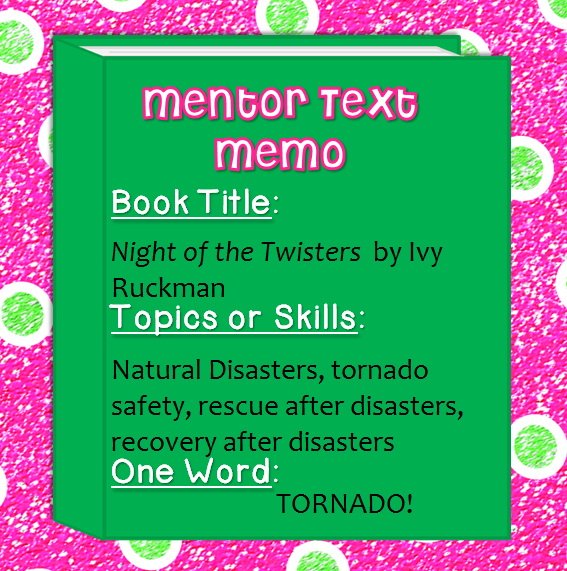 The book describes their efforts to stay safe, the actual tornado event (as it passes over them), and the scenes of destruction after the storm. It is quite dramatic! This book is particularly difficult in my community as all of the students remember the tornado events of April 27, 2011. The storm system that day damaged and destroyed many of our surrounding Alabama counties and left us all without electricity for about 5 days. This year, as I read this book aloud, I had to stop periodically and assure the children that everything in the book would be alright. They really were sitting on the edge of their seats as I read. I use this book when we study natural disasters in my classroom. Our focus of the study is on relief and recovery efforts and we research the many ways people can help out after a disaster. This is especially poignant here because so many of our boys and girls did go to our neighboring counties and help with clean up and delivery of food and water. The book is based on a real life event! 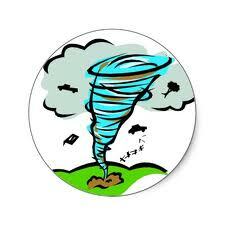 The tornado in the book happened in Grand Island, Nebraska in 1980. Click on the tornado below to find a link to photos of the real damage done by that storm. Thank you for sharing this text and your experiences. I will have to pick up a copy. This is a new book for me. Thanks for sharing. I will have to check it out. I have not heard of this book! Thank you for sharing it and linking it up! I have never heard of this book either. I'm sure your kiddos love reading about extreme weather. Kids are always fascinated with tornados! I will have to look for this book! I am a new follower!